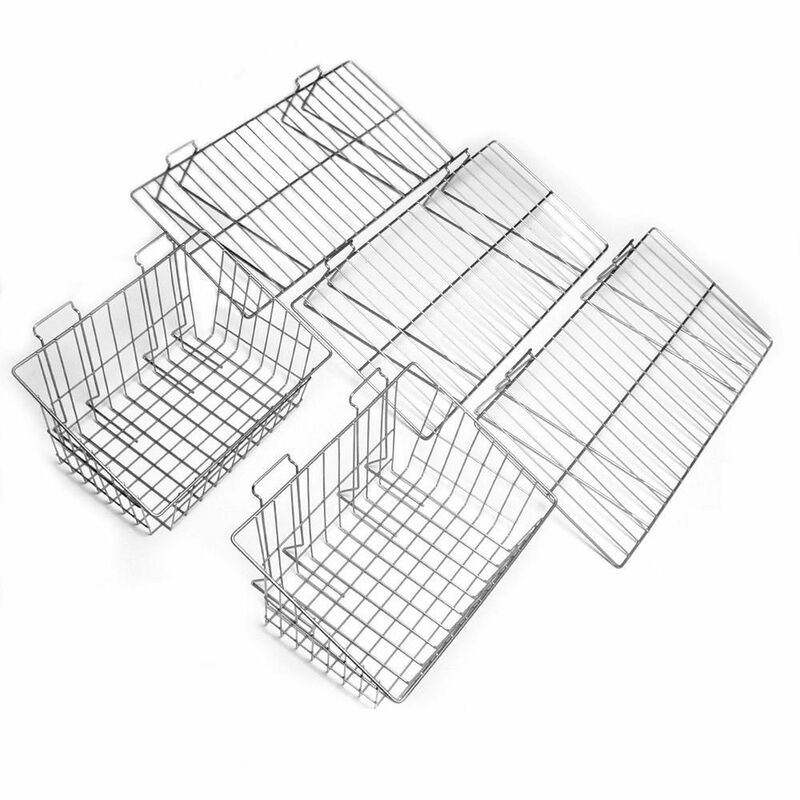 Proslat's shelf and basket kit offers you a mix of our two most popular shelves and baskets. Three 12" x 24" shelves & two 12"x 8" steel wire baskets are made of high grade steel, and powder coated in Proslat silver for years of rugged durability. Ideal for storing cleaning supplies, toys, or other goods that require visibility and easy access. Proslat Hooks & Accessories are designed & engineered exclusively for Proslat wall panels for maximum load bearing capacity. A simple solution to freeing-up valuable floor space in a garage, attic, basement, workshop or other areas, the Gladiator Premier Series GearLoft shelf is made of heavy-duty steel with a powder-coated finish for corrosion resistance and lasting durability. Plenty strong and sturdy with a 100 lb. capacity, this shelf is designed to be used with Gladiator GearTrack Channels and GearWall Panels and is both easy to install and easy to reposition as your storage needs change. Perfect for storing a wide range of items such as coolers, luggage, sports equipment and Christmas decorations, this shelf is built-to-last and coordinates with other Gladiator storage products for added functionality and a uniform look. Proslat Locking Ski Hook/bat rack (package of 2) is a multi-purpose hook. Each hook holds 1-pair skis/poles or bat & glove. Stow your gear in style with this set of hooks. Made of robust heavy duty steel and powder coated in Proslat Silver. Rubber cushioned hooks to protect your equipment. Each hook can hold up to 25 pounds. 5-Piece Shelf & Basket Kit for Garage Wall Storage Systems Proslat's shelf and basket kit offers you a mix of our two most popular shelves and baskets. Three 12" x 24" shelves & two 12"x 8" steel wire baskets are made of high grade steel, and powder coated in Proslat silver for years of rugged durability. Ideal for storing cleaning supplies, toys, or other goods that require visibility and easy access. 5-Piece Shelf & Basket Kit for Garage Wall Storage Systems is rated 4.8 out of 5 by 28. Rated 5 out of 5 by Andrew from The 3 shelves and 2 baskets in this bundle add... The 3 shelves and 2 baskets in this bundle add to the storage capacity and flexibility of the Proslat wall storage system at less cost than if these pieces were purchased separately. Rated 5 out of 5 by Eric from Very easy to install. All the components hook and move... Very easy to install. All the components hook and move easily as well as hold a substantial amount of weight. Very pleased with this product. Rated 5 out of 5 by Steve from Needed some more storage on my trackwall and these worked very well. Needed some more storage on my trackwall and these worked very well. Rated 5 out of 5 by Dan from Well made. Look good and work very well. ... Well made. Look good and work very well. Rated 5 out of 5 by Alan from I'm really enjoying them.... I'm really enjoying them. Are these compatible with the current husky track wall?